Continuous generation of new neurons within the adult dentate gyrus contributes to hippocampus-dependent learning and synaptic plasticity, and directly impacts brain function in health and disease. “Acute” running has been shown to robustly increase the proliferative phase of adult hippocampal neurogenesis (van Praag et al., 1999a,b; Kronenberg et al., 2003). However, no known mechanisms directly link physical activity with precursor cell proliferation. Candidate factors include serotonin (Meeusen et al., 1996; Gomez-Merino et al., 2001; Klempin et al., 2010), IGF-1 (Carro et al., 2000; Trejo et al., 2001), VEGF (Jin et al., 2002; Fabel et al., 2003), BDNF (Johnson et al., 2003; Adlard et al., 2005; Moon et al., 2012), and endocannabinoids (Hill et al., 2010; Wolf et al., 2010), which participate in the modulation of adult neurogenesis and are upregulated following running. Serotonin (5-HT, 5-hydroxytryptamine) has attracted much attention in the context of theories linking major depression to failing adult neurogenesis (Russo-Neustadt et al., 1999; Malberg et al., 2000; Santarelli et al., 2003). The dentate gyrus is highly enriched with serotonergic fibers, and the beneficial effects of antidepressant drugs that primarily target the central serotonin system have been shown to require the generation of new granule neurons (Brezun and Daszuta, 2000; Klempin et al., 2010). Intriguingly, both serotonin and physical activity have proneurogenic and antidepressant effects, but whether the effect of running is dependent on central serotonin has not yet been explored until now. We have previously discovered that tryptophan hydroxylase (TPH) 2 mediates 5-HT synthesis in the brainstem raphe nuclei (Walther et al., 2003) and developed the Tph2-deficient (Tph2−/−) mouse (Alenina et al., 2009), which is selectively depleted in brain-derived serotonin. Here we took advantage of this new mouse model to directly test the action of serotonin and its role in activity-dependent regulation of adult neurogenesis. In presence or absence of exercise, we have conducted in vivo experiments to determine proliferation of dentate gyrus precursor cells in Tph2−/− mice. Our results demonstrate that serotonin is an essential positive modulator of neurogenesis that specifically functions in response to an acute running stimulus. This important observation will add to our understanding of the mechanisms by which exercise modulates mood and memory. The generation of Tph2−/− mice has been described in detail previously (Alenina et al., 2009). Tph2−/− mice were established on a C57BL/6N background (F10 generation backcross; Charles River) (Mosienko et al., 2012). Young-adult [6 weeks of age, postnatal day (P) 42], adult (3 months of age, P80), and 1-year-old female Tph2−/− mice, their Tph2+/+ littermates, or C57BL/6N mice (as control for P42) were used to investigate the role of serotonin on proliferation and increased hippocampal neurogenesis following physical activity. Sixty animals were divided into two groups for “baseline” conditions (standard cage, 3–6 mice per cage), and “RUN” conditions (single housed in a standard cage plus running wheel), and held for 6 d with a 12 h light/dark cycle and ad libitum access to food and water. Mice in RUN conditions had unlimited access to the running wheel for 6 d, and running distance was monitored. To analyze proliferation, animals received three intraperitoneal injections of bromodeoxyuridine (BrdU; 50 mg/kg body weight dissolved in 0.9% NaCl; Sigma-Aldrich) 6 h apart on day 6 and were killed 24 h after the first injection. All experiments were performed according to national and institutional guidelines and were approved by the relevant authority [Landesamt für Gesundheit und Soziales (LaGeSo), Berlin, Germany]. Mice were deeply anesthetized with isoflurane and perfused transcardially with 0.9% sodium chloride followed by 4% paraformaldehyde (PFA) in 0.1 m phosphate buffer. Brains were removed from the skulls, postfixed in 4% PFA at 4°C overnight, and transferred into 30% sucrose. Sequential 40 μm coronal sections were cut on a microtome (Leica Bensheim) and cryoprotected. For BrdU staining, DNA was denatured in 2N HCl for 20 min at 37°C. Sections were then rinsed in 0.1 m borate buffer and washed in Tris-buffered saline (TBS). Sections were stained free-floating with all antibodies diluted in TBS containing 3% donkey serum and 0.1% Triton X-100. Primary antibodies were applied in the following concentrations: anti-BrdU (rat, 1:500; Biozol), anti-doublecortin (anti-DCX) (goat, 1:250; Santa Cruz Biotechnology), anti-GFAP (rabbit, 1:2000; Acris Antibodies), anti-GFAP (mouse, 1:1000; Sigma-Aldrich), anti-Sox2 (goat, 1:1000; Santa Cruz Biotechnology), anti-iba-1 (goat, 1:500; Abcam), anti-caspase 3 (rabbit, 1:500; Cell Signaling Technology). For immunofluorescence, Alexa488-conjugated, Cy3-conjugated, Cy5-conjugated, or Alexa647-conjugated secondary antibodies (Jackson ImmunoResearch Laboratories) were used at a concentration of 1:250. Fluorescent sections were coverslipped in polyvinyl alcohol with diazabicyclooctane (PVA-DABCO; kind gift from Dr. Golo Kronenberg) as antifading agent; or Vector shield (Vector Laboratories). Immunohistochemistry followed the peroxidase method with biotinylated secondary antibodies (1:500; Jackson ImmunoResearch Laboratories), ABC Elite reagent (Vector Laboratories), and diaminobenzidine (DAB; Vector Laboratories) as chromogen. For BrdU labeling, one-in-six series of sections of each brain were stained for light microscopy (peroxidase method), and immunoreactive cells were counted throughout the rostrocaudal extent of the dentate gyrus. Results were multiplied by six to obtain the total number of BrdU-positive cells per dentate gyrus. One-in-twelve series of sections were either stained for Sox2 following the peroxidase method (and multiplied by 12 to obtain absolute numbers), or labeled for multiple-immunofluorescence staining as described above for phenotypic analysis. Fifty to 100 randomly selected cells per animal were evaluated for three-dimensional colocalization by examining orthogonal views from a series of confocal microscope focal planes using a Leica TCS SP5 (Leica) confocal microscope. Statistical differences between group means were evaluated by ANOVA analysis followed by Tukey's post hoc tests, in cases where a significant F statistic was obtained (GraphPad PRISM 5.01 software). For individual comparisons, a Student's t test was used. All values are expressed as mean ± SE. P values of ≤0.05 were considered statistically significant. First, we quantified baseline proliferation of dentate gyrus precursor cells in young-adult (P42), adult (P80), and 1-year-old animals that lack brain serotonin (Fig. 1A). The number of proliferating cells in Tph2−/− mice 24 h after the first BrdU injections did not differ compared with wild-type (WT) mice at P42 (2321 ± 148 vs 2078 ± 89, respectively; p = 0.2165, n = 6) and P80 (1551 ± 204 vs 1503 ± 128, respectively; p = 0.849, n = 4), and was slightly increased at 1 year of age (264 ± 20 vs 159 ± 18, respectively; p = 0.012, n = 4; Fig. 1B,C). These data showed that, surprisingly, serotonin is not required for baseline proliferation of hippocampal precursor cells. Lack of TPH2 prevents the proproliferative effect of running. A, The number of proliferating cells in running animals (RUN) and sedentary controls (Baseline) was quantified at day 7, 24 h after the first of three intraperitoneal injections of BrdU. Running distances revealed no differences between genotypes with 1-year-old mice running significant less. B, DAB-staining of BrdU-positive cells in the SGZ for different ages, genotypes, and conditions. GCL, granule cell layer. C, At baseline, the absolute number of proliferating cells is similar between WT and Tph2−/− mice at P42 and P80, and is slightly enhanced in 1-year-old Tph2−/− mice. Notably, while running robustly increased proliferation in WT animals for all age groups, no effect was seen in P42 and 1-year-old Tph2−/− mice with a slight increase at P80. *p < 0.05, **p < 0.01, ***p < 0.001 indicate statistical significance relatively to sedentary controls of the same genotype, #p < 0.05, ##p < 0.01 between WT and Tph2−/− for same condition, and $p < 0.05 to previous age (SEM). Scale bar, 120 μm. We next tested whether Tph2-deficient mice have an intact neurogenic response to exercise. Young and adult WT and Tph2−/− mice with a running wheel (RUN) showed similar running distances for 6 d, with 1-year-old mice running significantly less than the younger mice of same genotype (Fig. 1A). One week of exercise robustly increased the number of BrdU-positive cells in the subgranular zone (SGZ) of control animals in all age groups compared with sedentary controls (P42, n = 5, p < 0.001; P80, p < 0.001, n = 5; 1 year, p = 0.0051, n = 6; Fig. 1B,C). In contrast, Tph2−/− mice had no increase in proliferation (P42, n = 5, p = 0.2533; 1-year-old, p = 0.900, n = 5), or a markedly attenuated (P80, p = 0.0168, n = 6) increase in proliferation (Fig. 1C). Our data also confirmed that neurogenesis declined with aging in both running and sedentary controls (p < 0.05, p < 0.001, and p < 0.0001, respectively; Fig. 1C) (Kronenberg et al., 2006). To determine the cell types affected during running, BrdU-positive cells were costained for stem/progenitor markers of the neural lineage: the glial fibrillary acidic protein (GFAP), the precursor marker Sox2 (SRY-related HMG-box gene 2), and the transient immature neuronal marker DCX. Quantitative assessment revealed no changes in the number of BrdU/GFAP-positive type-1 cells (morphology-wise radial glia-like stem cells) at P42 (p = 0.236; Fig. 2A) and P80 (p = 0.160; Fig. 2B) following exercise. A significant reduction in type-1 cell numbers was seen in Tph2−/− mice at P80 in running conditions (WT, 110 ± 40; Tph2−/−, 29 ± 15; p = 0.026; Fig. 2B). However, acute running significantly increased the number of BrdU/Sox2-positive nonradial type-2a cells (GFAP-negative; P42, p = 0.0073; P80, p < 0.001; Fig. 2A,B), and BrdU/DCX-positive cells (type-2b/3; P42, p = 0.011; P80, p < 0.001; Fig. 2A,B) in WT animals compared with baseline, and compared with Tph2−/− mice. Yet, following acute running, the population of Sox2-positive proliferating precursor cells was most affected, and the number increased threefold. Neither cell population changed under running conditions in P42 and 1-year-old (data not shown) Tph2−/− mice, while type-2b/3 cells were slightly increased at P80 (baseline, 554 ± 107; RUN, 864 ± 86; p = 0.0368; Fig. 2B). Together, these data demonstrate that running-induced neurogenesis is abolished in mice that lack central serotonin. Running-induced effects on neuronal phenotypes in Tph2−/− and WT mice. A, B, The number of BrdU/GFAP quiescent type-1 stem cells did not change between conditions and genotypes at P42 (A) and was slightly altered between WT and Tph2−/− after running at P80 (B). Proliferating progenitor cells expressing Sox2 (type 2a) or DCX (type-2b/3) were increased in WT following exercise, and markedly attenuated in Tph2−/− mice. Notably, the number of Sox2 type-2a cells was already significantly enhanced in P42 Tph2−/− mice at baseline (A). *p < 0.05, **p < 0.01, ***p < 0.001 indicate statistical significance relatively to sedentary controls of the same genotype, and #p < 0.05, ##p < 0.01 between WT and Tph2−/− for same condition (SEM). Surprisingly, when we looked at baseline levels, Tph2−/− mice had significantly more proliferating Sox2-positive cells at P42 compared with WT animals (816 ± 130 vs 388 ± 51, respectively; p = 0.0428; Fig. 2A). The number of these cells had doubled and no further increase following running was observed. At P80, too, the number of BrdU/Sox2-positive cells in Tph2−/− mice was increased but the difference failed to reach statistical significance (394 ± 59 vs 290 ± 30; p = 0.081; Fig. 2B). Sox2-positive type-2a cells represent a certain developmental stage of neuronal and glial fate decision (Steiner et al., 2006). Sox2 is downregulated as neural precursor cells commit to a neuronal fate and divide rapidly. Considering the stable and equal rate of DCX production for both genotypes at baseline (Fig. 2A,B; frequency distribution ranges from 33.7 to 39.9% between all groups), the increase in BrdU/Sox2 coexpression may indicate a compensatory mechanism by which neurogenesis is developmentally regulated in the absence of serotonin. We therefore characterized Sox2-positive cells in more depth and investigated their phenotypes. We specifically measured coexpression with GFAP at P42 for both conditions and genotypes, and we counted total numbers of Sox2-expressing cells that include both BrdU-positive and BrdU-negative cells. Interestingly, the proportion of Sox2-positive cells in Tph2−/− mice costained for GFAP was significantly lower at baseline compared with WT (733 ± 57 vs 1565 ± 183, respectively; p = 0.012) but doubled following exercise and reached WT levels (Fig. 3A). Sox2/GFAP-positive cells comprise neural stem cells and astrocytes but due to the alignment at the SGZ they are primarily stem cells. These data indicate that the numbers of putative quiescent stem cells and early progenitor cells (expressing Sox2) are affected in conditions of lifelong depletion of central serotonin. This is typified by a relative decrease in the number of Sox2/GFAP-positive cells combined with an increase in proliferating type-2a cells. Our data potentially indicate a premature exit from cell cycle or progression from neural stem cells to transient amplifying cells due to loss of brain serotonin. Sox2 precursor cells divide more rapidly to keep this and the next progenitor status stable (type 2 and type 3). Sox2-expressing cells are highly affected in Tph2−/− mice. A, At P42, the number of overall Sox2/GFAP-expressing cells in Tph2−/− mice was significantly lower at baseline but doubled following exercise. 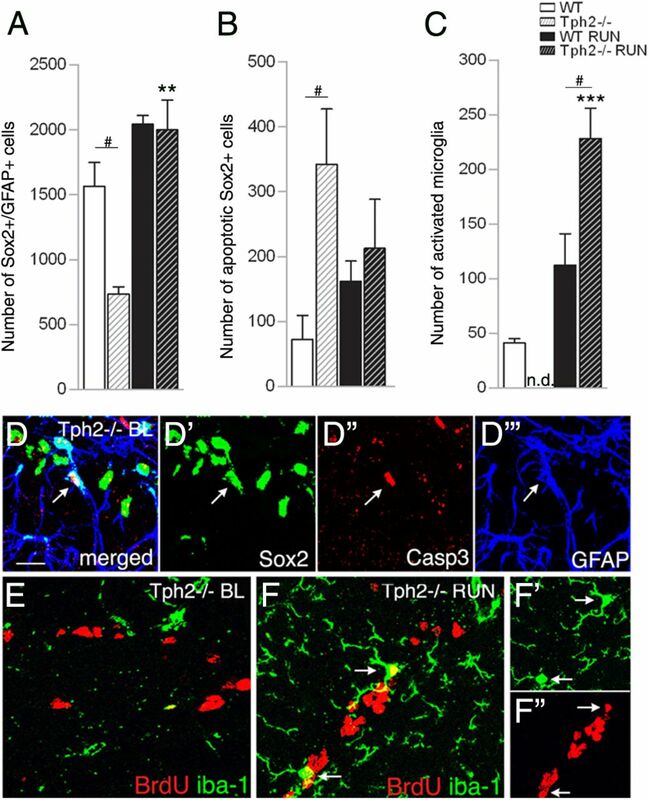 B, At baseline, a significantly higher number of Sox2-expressing apoptotic cells (coexpression of Sox2/Caspase3), and increased microgliosis following running (C) was found in Tph2−/− mice. D, Confocal microscopy images of Sox2/Caspase3/GFAP coexpression (arrow), and (E) BrdU/iba-1 in Tph2−/− mice at P42 baseline levels (BL). F, Increased microgliosis in Tph2−/− mice following exercise (arrows indicate coexpression of BrdU/iba-1). Notably, the number of total iba-1-positive microglia is generally increased following exercise independently of genotype, and less frequent in sedentary mice. n.d., not detectable. Scale bar, 25 μm. **p < 0.01, ***p < 0.001 indicate statistical significance relatively to sedentary controls of the same genotype, and #p < 0.05, between WT and Tph2−/− for same condition (SEM). We also found an increase in Sox2-positive cell apoptosis in Tph2−/− mice at baseline (342 ± 85; WT, 72 ± 37, p = 0.044; Fig. 3B,D), which could explain the lower number of Sox2/GFAP-positive cells shown in Figure 3A (percentage distribution accounts for 10.1 ± 2.2% vs 1.8 ± 1.1%, respectively). The increase in cell death could also signal back to hasten transition of Sox2/GFAP-positive cells to the next stage to maintain the transient amplifying population. In response to running, Sox2/GFAP-positive cells accumulated, indicating an amplification of the stem-cell population as a result of exercise (baseline, 733 ± 75; RUN, 1999 ± 231; p = 0.006; Fig. 3A). Furthermore, running Tph2−/− mice showed significantly more BrdU/iba1 coexpression compared with WT (228 ± 23 vs 114 ± 28, respectively; p = 0.023), and compared with baseline (p < 0.001; Fig. 3C,F) indicating increased microgliosis. Notably, accumulation of microglia was generally observed following the running stimulus and fewer microglia were detectable in sedentary mice (Fig. 3C,E). Together, these data suggest that Tph2−/− mice are deficient in the transition of Sox2-positive precursor cells toward DCX-positive progenitor cells with a lower level of quiescent type-1 stem cells and higher cell death rate. Although this is compensated at baseline levels by increased Sox2-positive cell proliferation, cells fail to enhance differentiation into neuroblasts following running. In our study, we analyzed the role of serotonin in adult hippocampal neurogenesis using Tph2−/− mice, an animal model that lacks brain serotonin. Surprisingly, permanent depletion of serotonin does not affect baseline adult neurogenesis; this result was unexpected based on previous studies indicating the serotonin system to be a potent neurogenic modulator. In contrast, we discovered that serotonin is essential for exercise-induced neurogenesis. Finally, changes in proliferation and survival of Sox2-positive cells, and the deficiency in the transition to DCX-positive progenitor cells, revealed a potential physiological compensatory mechanism in the absence of serotonin. The role of serotonin in adult hippocampal neurogenesis has been extensively discussed. However, previous studies have relied on pharmacological manipulation or receptor targeting. This is the first approach to test serotonin action in a loss-of-function model in which the availability of brain-derived serotonin is selectively eliminated. Previous results have shown that the generation of new neurons is positively regulated via different serotonin receptor subtypes active at sequential steps in the course of adult neurogenesis (Malberg et al., 2000; Duman et al., 2001; Malberg and Duman, 2003; Encinas et al., 2006; Klempin et al., 2010). Our current data based on a genetic model shed a distinct light on the mechanisms proposed in these studies based on acute manipulation of 5-HT receptor signaling but also from data obtained in 5-HT synthesis inhibition or serotonergic lesion models (by parachlorophenylalanine or 5,7-DHT injections) (Brezun and Daszuta, 1999; Jha et al., 2006). Potentially, these treatments might have affected other neurotransmitter pathways and cotransmitter systems, confounding the interpretation of the results. Our current data clearly revealed that lifelong depletion in Tph2−/− mice had no measurable change in baseline proliferation when compared with WT mice at different ages. We propose that this is potentially due to an enduring change in the balance of proliferation and cell death rate at the level of type-1 and type-2 precursor cells in the absence of serotonin. The hypothesis is that serotonin facilitates the transition of quiescent to amplifying progenitor cells. In Tph2−/− mice, we detected that Sox2-positive cells proliferate more to possibly balance stem-cell loss and to sustain the progenitor cell pool. Nevertheless, our data establish that central serotonin is necessary for a fast neurogenic response of the niche to changes in physical activity. Tph2−/− mice did not show increased proliferation following exercise (Fig. 1). This indicates that other signaling pathways cannot compensate for the absence of serotonin during the onset of activity. We hypothesize that increased availability of tryptophan during exercise increases 5-HT production and release from its projections in the hippocampus (Meeusen et al., 1996; Béquet et al., 2002), where it stimulates neurogenesis via different serotonin receptors active at different cell types in the niche (Brezun and Daszuta, 2000; Klempin et al., 2010). Sox2-positive type-2a cells are highly affected following an acute running stimulus as shown here, and described previously (Kronenberg et al., 2003; Steiner et al., 2008). Whenever serotonin is absent, these cells either die or fail to transform into immature neurons, even in running conditions. We found an increase in apoptosis of Sox2-positive cells, which correlated with increased microgliosis following exercise. Voluntary running has been shown to induce the number of new microglia in other brain regions (Ehninger and Kempermann, 2003). It was generally observed for both genotypes in our study, with a significant higher proportion in mutant mice as reaction to cell death of precursor cells. We cannot completely rule out effects of short-term social isolation on the outcome of the running experiment, including its impact on the stem-cell pool (Song et al., 2012). However, our data from WT mice are in line with recent studies showing that isolation does not negatively affect precursor proliferation following exercise (Kannangara et al., 2009; Marlatt et al., 2010). For Tph2−/− mice, the putative quiescent stem-cell pool (type-1 cells) that has been lower at baseline regained normal numbers following exercise (no differences to WT). This might be potentially due to a failure of cells to progress to the progenitor cell stage or to re-enter cell cycle. We cannot prove either conclusion based on our approach. Our study suggests the existence of compensatory mechanisms, which occur in the lifelong absence of serotonin. We cannot exclude the possibility that other neurotransmitters [e.g., noradrenaline (NA)] could partly mediate an effect on adult neurogenesis in Tph2−/− mice as we (data not shown) and others (Gutknecht et al., 2012) revealed a decrease in NA concentrations in the hippocampus and other brain areas in these mice. However, our baseline data demonstrate no changes in proliferation in the Tph2−/− mouse, indicating that reduced NA concentrations in these mice do not affect homeostatic maintenance of neurogenesis. Our data are the first to place central serotonin specifically within the modulation of exercise-induced neurogenesis, and contribute to the understanding of regulatory signals in adult neurogenesis. Future experiments should examine the direct coupling of exercise-induced serotonin release and neuronal plasticity to better define the site of action of this monoamine. A clear understanding of the pharmacology of serotonin action could lead to alternative approaches for treatment of depression or age-related decline in learning and memory. This work was supported by a grant of the Ministry of Education and Science of the Russian Federation to N.A. We thank the microscopy core facility of the Max-Delbruck-Center for Molecular Medicine, Berlin, for technical assistance. (2005) The exercise-induced expression of BDNF within the hippocampus varies across life-span. Neurobiol Aging 26:511–520, doi:10.1016/j.neurobiolaging.2004.05.006, pmid:15653179. (2009) Growth retardation and altered autonomic control in mice lacking brain serotonin. Proc Natl Acad Sci U S A 106:10332–10337, doi:10.1073/pnas.0810793106, pmid:19520831. (2002) Evidence that brain glucose availability influences exercise-enhanced extracellular 5-HT level in hippocampus: a microdialysis study in exercising rats. Acta Physiol Scand 176:65–69, doi:10.1046/j.1365-201X.2002.01015.x, pmid:12193220. (1999) Serotonin depletion in the adult rat produces differential changes in highly polysialylated form of neural cell adhesion molecule and tenascin-C immunoreactivity. J Neurosci Res 55:54–70, doi:10.1002/(SICI)1097-4547(19990101)55:1<54::AID-JNR7>3.0.CO%3B2-C, pmid:9890434. (2000) Serotonergic reinnervation reverses lesion-induced decreases in PSA-NCAM labeling and proliferation of hippocampal cells in adult rats. Hippocampus 10:37–46, doi:10.1002/(SICI)1098-1063(2000)10:1<37::AID-HIPO4>3.3.CO%3B2-3, pmid:10706215. (2000) Circulating insulin-like growth factor I mediates effects of exercise on the brain. J Neurosci 20:2926–2933, pmid:10751445. (2001) Regulation of adult neurogenesis by psychotropic drugs and stress. J Pharmacol Exp Ther 299:401–407, pmid:11602648. (2003) Regional effects of wheel running and environmental enrichment on cell genesis and microglia proliferation in the adult murine neocortex. Cereb Cortex 13:845–851, doi:10.1093/cercor/13.8.845, pmid:12853371. (2006) Fluoxetine targets early progenitor cells in the adult brain. Proc Natl Acad Sci U S A 103:8233–8238, doi:10.1073/pnas.0601992103, pmid:16702546. (2003) VEGF is necessary for exercise-induced adult hippocampal neurogenesis. Eur J Neurosci 18:2803–2812, doi:10.1111/j.1460-9568.2003.03041.x, pmid:14656329. (2001) Site-dependent effects of an acute intensive exercise on extracellular 5-HT and 5-HIAA levels in rat brain. Neurosci Lett 301:143–146, doi:10.1016/S0304-3940(01)01626-3, pmid:11248443. (2012) Impacts of brain serotonin deficiency following Tph2 inactivation on development and raphe neuron serotonergic specification. PLoS One 7:e43157, doi:10.1371/journal.pone.0043157, pmid:22912815. (2010) Endogenous cannabinoid signaling is required for voluntary exercise-induced enhancement of progenitor cell proliferation in the hippocampus. Hippocampus 20:513–523, doi:10.1002/hipo.20647, pmid:19489006. (2006) Selective serotonin depletion does not regulate hippocampal neurogenesis in the adult rat brain: differential effects of p-chlorophenylalanine and 5,7-dihydroxytryptamine. Brain Res 1075:48–59, doi:10.1016/j.brainres.2005.12.110, pmid:16460708. (2002) Vascular endothelial growth factor (VEGF) stimulates neurogenesis in vitro and in vivo. Proc Natl Acad Sci U S A 99:11946–11950, doi:10.1073/pnas.182296499, pmid:12181492. (2003) Hippocampal brain-derived neurotrophic factor but not neurotrophin-3 increases more in mice selected for increased voluntary wheel running. Neuroscience 121:1–7, doi:10.1016/S0306-4522(03)00422-6, pmid:12946694. (2009) Stress differentially regulates the effects of voluntary exercise on cell proliferation in the dentate gyrus of mice. Hippocampus 19:889–897, doi:10.1002/hipo.20514, pmid:18958850. (2010) Oppositional effects of serotonin receptors 5-HT1a, 2, and 2c in the regulation of adult hippocampal neurogenesis. Front Mol Neurosci 3:14, doi:10.3389/fnmol.2010.00014, pmid:20721314, pii. (2003) Subpopulations of proliferating cells of the adult hippocampus respond differently to physiologic neurogenic stimuli. J Comp Neurol 467:455–463, doi:10.1002/cne.10945, pmid:14624480. (2006) Physical exercise prevents age-related decline in precursor cell activity in the mouse dentate gyrus. Neurobiol Aging 27:1505–1513, doi:10.1016/j.neurobiolaging.2005.09.016, pmid:16271278. (2003) Cell proliferation in adult hippocampus is decreased by inescapable stress: reversal by fluoxetine treatment. Neuropsychopharmacology 28:1562–1571, doi:10.1038/sj.npp.1300234, pmid:12838272. (2000) Chronic antidepressant treatment increases neurogenesis in adult rat hippocampus. J Neurosci 20:9104–9110, pmid:11124987. (2010) Comparison of neurogenic effects of fluoxetine, duloxetine and running in mice. Brain Res 1341:93–99, doi:10.1016/j.brainres.2010.03.086, pmid:20381469. (1996) Effects of tryptophan and/or acute running on extracellular 5-HT and 5-HIAA levels in the hippocampus of food-deprived rats. Brain Res 740:245–252, doi:10.1016/S0006-8993(96)00872-4, pmid:8973821. (2012) Macrophage migration inhibitory factor mediates the antidepressant actions of voluntary exercise. Proc Natl Acad Sci U S A 109:13094–13099, doi:10.1073/pnas.1205535109, pmid:22826223. (2012) Exaggerated aggression and decreased anxiety in mice deficient in brain serotonin. Transl Psychiatry 2:e122, doi:10.1038/tp.2012.44, pmid:22832966. (1999) Exercise, antidepressant medications, and enhanced brain derived neurotrophic factor expression. Neuropsychopharmacology 21:679–682, doi:10.1016/S0893-133X(99)00059-7, pmid:10516964. (2006) Type-2 cells as link between glial and neuronal lineage in adult hippocampal neurogenesis. Glia 54:805–814, doi:10.1002/glia.20407, pmid:16958090. (2008) Differential 24 h responsiveness of Prox1-expressing precursor cells in adult hippocampal neurogenesis to physical activity, environmental enrichment, and kainic acid-induced seizures. Neuroscience 154:521–529, doi:10.1016/j.neuroscience.2008.04.023, pmid:18502050. (2001) Circulating insulin-like growth factor I mediates exercise-induced increases in the number of new neurons in the adult hippocampus. J Neurosci 21:1628–1634, pmid:11222653. (1999a) Running increases cell proliferation and neurogenesis in the adult mouse dentate gyrus. Nat Neurosci 2:266–270, doi:10.1038/6368, pmid:10195220. (1999b) Running enhances neurogenesis, learning, and long-term potentiation in mice. Proc Natl Acad Sci U S A 96:13427–13431, doi:10.1073/pnas.96.23.13427, pmid:10557337. (2003) Synthesis of serotonin by a second tryptophan hydroxylase isoform. Science 299:76, doi:10.1126/science.1078197, pmid:12511643. (2010) Cannabinoid receptor CB1 mediates baseline and activity-induced survival of new neurons in adult hippocampal neurogenesis. Cell Commun Signal 8:12, doi:10.1186/1478-811X-8-12, pmid:20565726.